Travis Banks has avenged a loss to the Four Nations with a win over the New South Wales super-group this past weekend. Banks—who was beaten as part of Team New Zealand alongside Pat Schisk and TK Cooper last year—joined forces with Australians Matt Basso and Massive Q to take down Adam Hoffman, Jack Bonza and Mick Moretti at Newcastle Pro Wrestling 38 on Saturday. 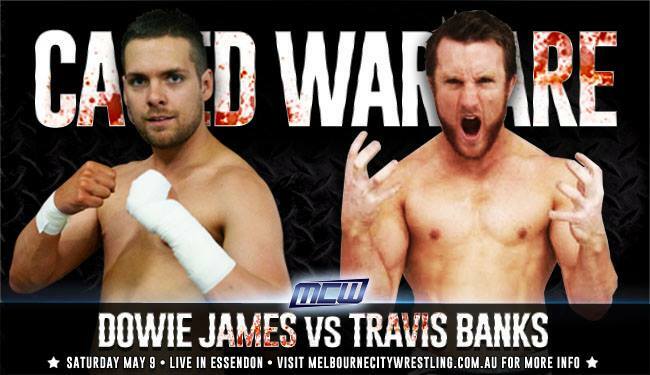 He will hope to score another win against Dowie James at MCW Caged Warfare in Melbourne this Saturday, May 9. Caged Warfare will mark Banks’ second appearance with MCW, having previously wrestled a triple threat bout against Chris Vice and current MCW Champion KrackerJak at MCW Clash of the Titans. James is also coming off a triple threat bout, defeating New Zealanders TK Cooper and expat Link Barnett at MCW Ascension earlier this year. MCW Caged Warfare will be headlined by an eight-man steel cage bout, pitting The Estate—including New Zealand’s Slade Mercer—against a four-man side captained by Mr Juicy.